What would you do if you were told you could no longer play the sport you love? How would you react? How would you try to stay involved with the game? And how would you deal with learning that someone in your favorite sport is cheating? Those are the questions facing Jeremiah, the hero of the book Soar by Joan Bauer. It’s an amazing novel about a boy who loves baseball but is kept off the field for health reasons. Yet, he perseveres and finds a meaningful way to still participate in the sport. For Jeremiah, baseball is life. But after receiving a heart transplant, he’s told he might never play again. When his adopted father, Walt, takes a job in a new city, Jeremiah hopes to join the town’s championship baseball team. Of course, he can’t because of his health issues. A bigger issue, though, is that the team is involved in a cheating scandal. A coach gave his players drugs when they did not know it. So, Jeremiah decides to help his town by getting involved with the sport in a different way: he becomes the informal coach of the baseball team for the younger kids. One of my favorite things about this book is its language. Bauer has a wonderful way of explaining complex issues such as cheating with drugs in baseball. For example, when a coach is accused of giving steroids to his players, Bauer records the conversation the Jeremiah and his father Walt have. Bauer does not like to tell you what the characters are feeling. Instead, she prefers to have them express it through dialogue, which I find a very relatable concept. As a softball player myself, these moments (especially that one) inspired me to work harder and improve more. But the best part of the book might be Jeremiah himself. Bauer said she did a lot of research about heart transplants by talking to both doctors and patients. That work comes through in Jeremiah. The reader is really able to feel what Jeremiah feels, even if she’s not experiencing his troubles. Bauer also drew on her experience with parents and kids who have gone through the adoption process. She said they have always inspired her, and that comes through in Jeremiah. He’s an inspiration character who follows his heart — even if the path is a little rocky. The word “soar” means “to fly high,” and that is most certainly what Jeremiah does — with a little help from his team, of course! Joan Bauer soars, too. 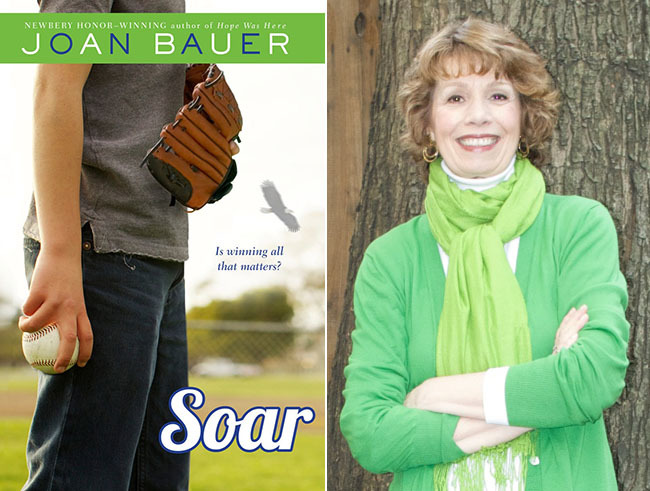 With her amazing novel, Bauer leaves readers wanting to know more about Jeremiah and Walt. And she makes us want to play baseball, especially if they can play for a coach like Jeremiah!